Simple Gallery creates simple but stylish photo gallery with extremely "easy-to-use" interface, just a few click from the interface to create a gallery.With over 10 transition effects and 40+ parameter, you can build up unique photo album in a min. You just need 1 mintue to convert your photo collection to cover flow gallery with many transition effects. User can customize the gallery for background color, styles, navigation menu, site title, site logo, full screen, etc. With 40+ parameters to fulfill your needs. 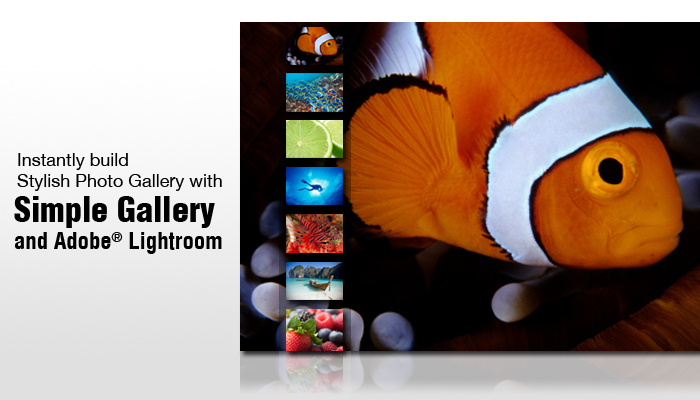 Simple Gallery provide over 40+ parameters to customize your gallery. All changes can be preview in the WYSIWYG Live Preview Panel in Lightroom. Photos can show in slideshow mode. Control buttons, transition effect can all be customized. Simple Gallery provide lot of transition effects such as cross fade, wipe, etc..
All navigation can do by mouse gesture. You can navigate through photos with mouse touch control. The gallery support full size image up to 5000 x 5000 resolution. User can touchscroll the full size image in the gallery. Support include meta data in the gallery. You can display meta data as caption. Or include information about your site in the gallery. Easy to Install - Simple Gallery comes with self-extract installer which copy the plug in into Lightroom automatically and create shortcut for help documents. Digicrafts developed ActionScript 3 engine - Original Lightroom 2 only support AS2 flash movie. Now we made it support Live Preview and export AS3 flash movie with our AS3 engine for Lightroom which provide more stable and smooth 3D effect..